Christmas cookies are a traditional part of holiday celebrations, but most recipes are high in fat, especially the saturated fat found in butter or shortening. If you are trying to reduce less-healthy fats, enjoy these eight great low-fat or reduced-fat cookie recipes that let you have your cookie and eat it, too. 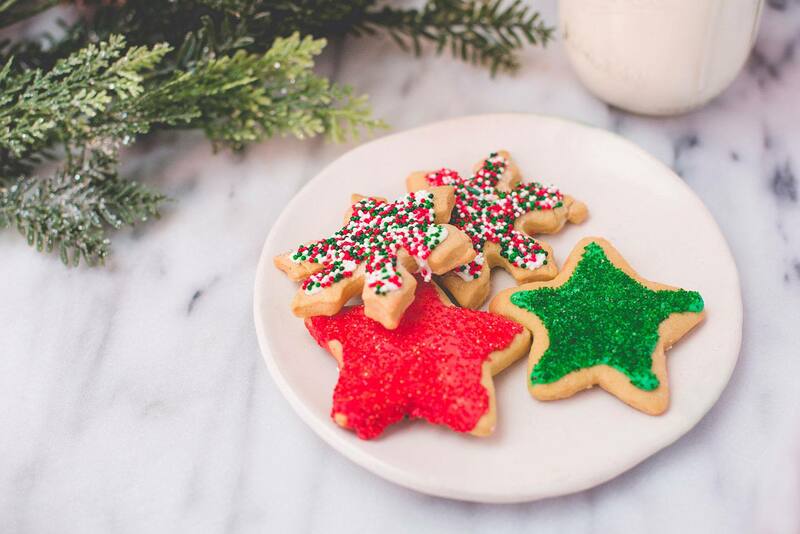 With almost half the butter of most sugar cookies, you can treat yourself to one of these low-fat Christmas cookies without feeling too guilty. You can use festive cookie cutters to make holiday cookies to decorate. Top them with sprinkles before baking or add a glaze afterward using confectioner's sugar, lemon juice, and some food coloring. Nobody has to know your secrets that lightened these cookies. These cookies have zero fat as they are made with egg whites, brown sugar, vanilla, and a simple cinnamon sugar topping. You can make them festive by piping them through a decorative star tip and then decorating with colored sprinkles. The outside is crunchy. Applesauce is the secret as to why these healthy vegan pumpkin cookies have almost no fat. They are made without oil, margarine, butter, milk, or cream. They are dairy-free and vegan. Pumpkin spice doesn't have to end at Thanksgiving, so enjoy these throughout the holiday season. A favorite of kids of all ages, these no-bake crispy rice cereal treats can be made extra special for the holidays using cookie cutters, colored food gel, and holiday-themed sprinkles. The kids will enjoy helping with this recipe but be prepared for a sticky mess. There is a little bit of butter in the recipe, but overall it is lower in fat than most cookie recipes. If you're looking for an even lighter cookie option for the holidays, then these low-fat mint chocolate chip meringue cookies will surely fit the bill. The only fat is in the chocolate chips themselves. Crisp on the outside and chewy on the inside, they make a tasty sweet and minty morsel. It's hard to believe these chocolate chip cookies are low fat. By using half the normal amount of butter and substituting an egg white for a whole egg, these make a wonderful and almost guilt-free indulgence. The chocolate flavor is enhanced by using cocoa powder as well as the chocolate chips. And by using mini chocolate chips, we're making a smaller quantity go a long way. Substituting fruit preserves for sugar is one of the tricks in these vegan fruit cookies. They are also made with no added fat, which reduces the calories as well. If you want to enjoy chocolate, these brownies can help you get your fix. They are not as dense as full-fat brownies but you don't get any strange aftertaste as with some low calorie/low-fat recipes or prepared products. You can also help control yourself by cutting them into small squares. Then, when you go back for seconds, you haven't overindulged.